A few months ago I was approached by Alpro to take part in the Zest Challenge 2013. I've always been a huge fan of Alpro - ever since I was about 13 I've only drank soya milk and this opened up a little love affair with the brand, so anything involving them gets me interested. In case you're wondering what the Zest Challenge is, it's the definition of a 'fun fitness challenge'. It's basically a women's only event involving a 5k or a 10k run around a rather busy assault course, full of fantastic fun activities, including waterslides, tyre crawls etc. I think it's a brilliant idea to inspire women to get active and enjoy a fun day out whilst doing so! Of course, the only issue for me is, I don't really 'do' exercise. I used to be fairly active, however times change. I am an incredibly lazy person and this also means I'm ever so slightly unfit. However, 2013 is the year I've decided I want to change this for good, and I thought completing the 5k race in the Zest Challenge would be the perfect motivation into getting where I want to be. The only other issue? I detest running. I have tried countless times to become a 'runner', all of which have failed miserably. You know at the start of Run, Fat Boy, Run where he thinks it's great running happily along, until two seconds down the road and he's bent over in agony? That's me. Okay, well, it WAS me. Somehow, I've managed to catch the running bug and I can't quite believe it. Alpro are sponsoring the event and of course, they offered to give me and the other lovely ladies taking part a helping hand in the fitness and healthy eating department. Me and the girls that make up 'Team Alpro' met up a few months ago to receive our fitness plans and advice from the fab PT Stuart Amory, along with a few treats from Alpro to get us kitted out for the event. It hasn't been easy, but knowing I have something to work towards has helped motivate me SO much. I've found sticking to a diet a lot easier than I thought I would, mainly thanks to the delicious goodies from Alpro. I am in LOVE with their Almond Milk - mhmm! It's amazing how quickly your body adapts when it comes to putting pressure on it. I could hardly run for thirty seconds before having to stop before I started training for the challenge, and now I can do 30 minutes solid running. Okay, so it wears me out and I sweat A LOT, but I can do it and that makes me really proud. Doing this challenge has also made me think about my fitness and has even inspired me to join a gym, something I swore I would never do. I have a long way to go, but I'm so happy with my progress and I am extremely excited for the Zest Challenge! The Zest Challenge takes place this Saturday, and although I'm pretty nervous I'm really looking forward to taking part. I just hope the weather holds up! I will be posting about the event afterwards to let you guys know how I get on. 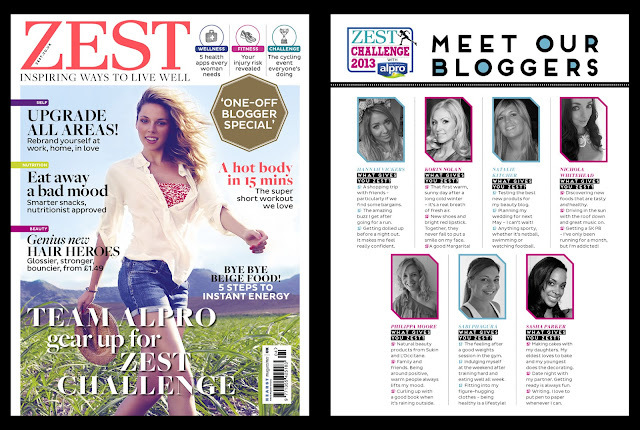 You can see the other girls taking part at the top of the page, but if you'd to keep up with us all as we take on the Zest Challenge you can find us on the Twitter hashtag #teamalpro. Wish us luck!